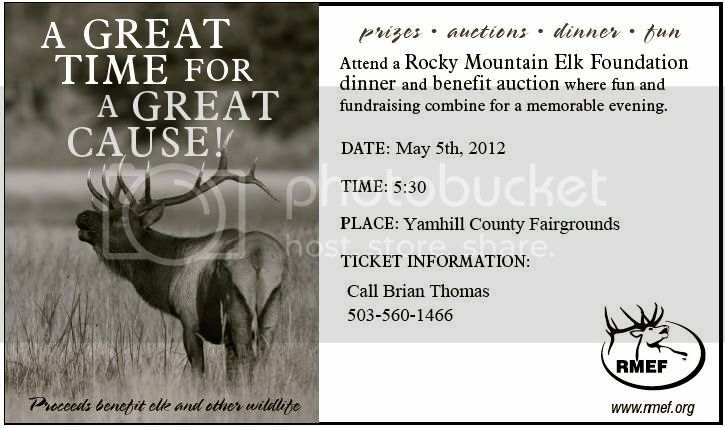 The McMinnville Chapter of the Rocky Mountain Elk Foundation is hosting its annual banquet on May 5th this year. A great fundraiser to support our wildlife! Like other banquets, there are tons of prizes, auction items, and games to be had this year. Excellent food too! We will have two RMEF champion elk callers coming to give a little presentation! Prizes are a coming in! I missed the last meeting so I don't have a good grasp on the current list. RMEF World Champion Bryan Langley and past champion Matt Lux will be doing an elk calling demonstration. Faith in the Field will be there showing some of their "best of's". Mainly, the Outdoor Dream Foundation hunt out of Tillamook with 18 year old Jessica Trotter from South Carolina. A very inspiring segment. Huge thanks for all that attended...all 180 of you. Twice the attendees over last year! We cleared $27,000, which put Oregon's yearly total over $1,000,000! It was an extreme pleasure to meet some famous guys face to face, finally. Faith in Field's Jeff and Dave, current RMEF World Champion Bryan Langely, and past champ Matt Lux. What an incredible treat to have these guys come. The Faith in the Field presentation about the Outdoor Dream Foundation elk hunt for Jessica had 180 people mesmerized and quite frankly, teary eyed. Thanks Jeff and Dave. Bryan and Matt entertained the crowd with their "incredibull" calling. It was cool to hear to wide range of calls, and learn how the contests are run. True masters of the call.